My recumbent exercise bike sits in "the gym", a spare room in our suburban house in the Pacific Northwest. I am really cycling, although I am safe & sheltered from real road conditions. 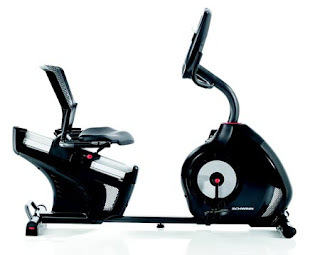 I had been cycling for exercise for a few years on an upright bike, but the seat & the posture were too uncomfortable to continue for more than 10-15 minutes at a time. This recumbent bike sets me up for good posture & efficient effort. It adjusts to my size & measures my progress. And I did make progress! Being fat & sedentary & low-energy, I started out cycling 3 miles at a time in 3rd "gear" (resistance level). The only requirement that I put on myself was to make baby steps of improvement. And I wanted improvement that I could sustain & build on. I began to graph my progress, and I still keep the graphs on a clipboard on a little table next to the bike. I had hoped to increase my mileage count by a tenth of a mile at a time, but the bike cannot be set in such small increments. In fact, when I called the company to learn how to do it, the answer was scornful. So I had to build my strength up before attempting a 33% increase from 3 miles to a full 4 miles. I could make efforts to increase my cycling speed (revolutions per minute) or the resistance level (1-20, like bicycle gears) or consistency (stick to a regular schedule). In every aspect of this effort, I looked for the smallest bit of progress that I could measure & maintain. At every stage, I felt that this was probably the best I would ever be able to do, and I just needed to keep it up. And then, at some point, I'd discover enough strength to try another baby step up. By October of 2015, I was able to cycle 10 miles at a time in 15th gear at about 40 rpm for a few days in a row. It took half an hour, and that seemed to me plenty of time out of my day. Continuing that routine and maintaining my strength seemed to be the best that I could strive for. And then the thought struck me! If I rode 10 miles in the real world, how far would it get me? If the "miles" I rode on the bike could be translated to miles from my home in Washington to my cousin's home in Vermont, how long would it take me to travel that far? Less than a year!